Recorded in London on February 4th, 2010. Alan Tomlinson was born in Manchester and studied trombone at the City of Leeds College of Music. 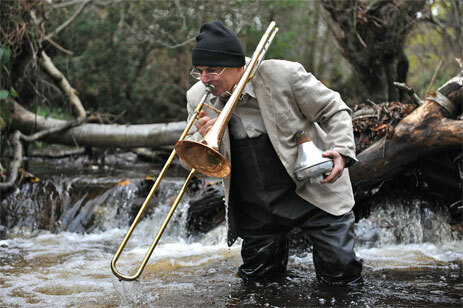 He has been actively improvising since the early 1970s and was a member of ILEA’s Cockpit Theatre Music Ensemble, Tony Oxley’s Angular Apron, Barry Guy’s London Jazz Composers Orchestra, the Ballet Rambert Orchestra and the Electo-Acoustic Cabaret. Alan works with many musicians including Jon Corbett, David Toop, Phil Minton Steve Beresford and Rger Turner and has toured all over Europe and as far afield as North America and Siberia. His first solo album, Still Outside, came out in 1980 and several composers have written solo pieces for him. He currently works with his own trio with Dave Tucker (guitar) and Phil Marks (drums). He is a member of the contemporary music groups Sounds Positive and the New Wind Chamber Group. Recorded in Alan’s kitchen where we also made several other wax cylinder recordings for a film soundtrack.